All transactions are safe and secure with a reliable history in online purchasing behind each of our associates. 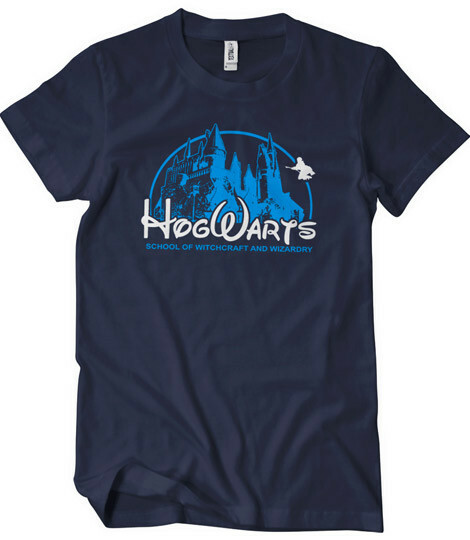 Buy the Harry Potter Hogwarts School t-shirt to own Harry Potter clothing and merchandise. One of our bestselling Harry Potter t-shirts, this Hogwarts Crest tee proudly displays a Disney-inspired Hogwarts seal on the front of the T. Show your support for the Hogwarts School of Witchcraft and Wizardry, founded over 1000 years ago by Godric Gryffindor, Salazar Slytherin, Rowena Ravenclaw, and Helga Hufflepuff. The four houses represented in the standard Hogwarts Crest were named after these four wizards and witches. This Hogwarts Harry Potter t-shirt features a creative Hogwarts logo. In addition to the Harry Potter Hogwarts School tee above, browse the Harry Potter Clothing Gallery for more apparel like men's and women's clothes, kids shirts or hoodies.